Dr. Rosenbaum is a medical doctor who works in San Francisco and lives in Marin. His partner, Barbara Shands, is an architect whose company is called Shands Studio. They have two young children and a very friendly mini Golden Retriever. 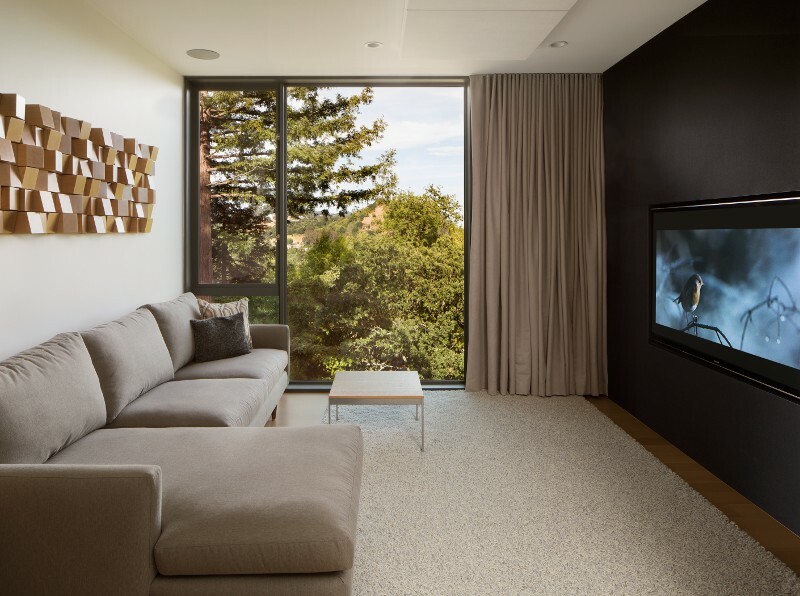 The couple were building their dream home in San Anselmo, Marin, and wanted a high performance “kid-proof” room to watch TV & movies in. The property was designed by Ms. Shands as a modern, minimalist style family home with lots of light and hard surfaces. Like many homes in the San Francisco Bay Area, real estate is at a premium, and even successful professionals simply do not have the space for the dedicated home theaters. The space allocated was a mere 12′ x 16’4″. The project was designed in 2012 and completed in 2014, with some upgrades after that. 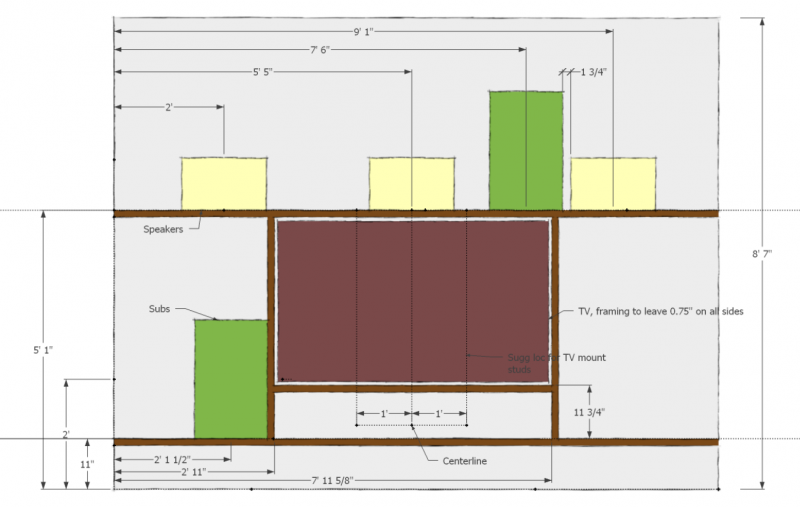 We completed our core home theater design package, which includes layout, low frequency optimization, AV equipment specification and acoustic treatment design. Layout was tricky due to the narrow width of the room and floor-to-ceiling windows on one side. After exploring different layouts with the client we settled on orienting the system across the narrow part of the room. An Acoustic Frontiers layout, c. 2012. Contrast with some of our latest documentation to see the evolution in quality of documentation! 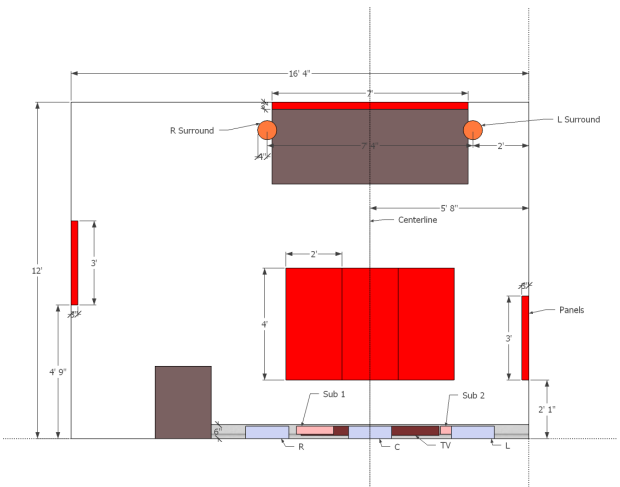 Low frequency optimization showed that three subwoofers were required for good seat-to-seat consistency across the couch. In the end we devised a 6″ deep false wall that hid the LCR speakers from Procella Audio (P6) and two Triad On-Wall SlimSubs. A high output JL E112 was located in the corner between the couch and the window. The JL was set to fill in only the lowest parts of the bass, under about 40Hz or so, with the Triads dealing with the range above that. Side surrounds were mounted in ceiling and the TV was recessed into the front wall. Acoustics were taken care of by the treatment hidden behind the fabric stretch on the front wall, the floor-to-ceiling curtains, the couch, rug and acoustical panels on the ceiling. Vicoustic Multifuser Wood 36 panels were used on the back wall to provide aesthetic interest as well as break up the LCR reflection. We calibrated the audio and video to HAA and ISF standards. Upgrades to the theater were undertaken in 2015 and 2016 by adding a miniDSP DDRC-88A for room correction and Torus Power TOT-MAX. The client was extremely pleased with the audible benefits of both updates. 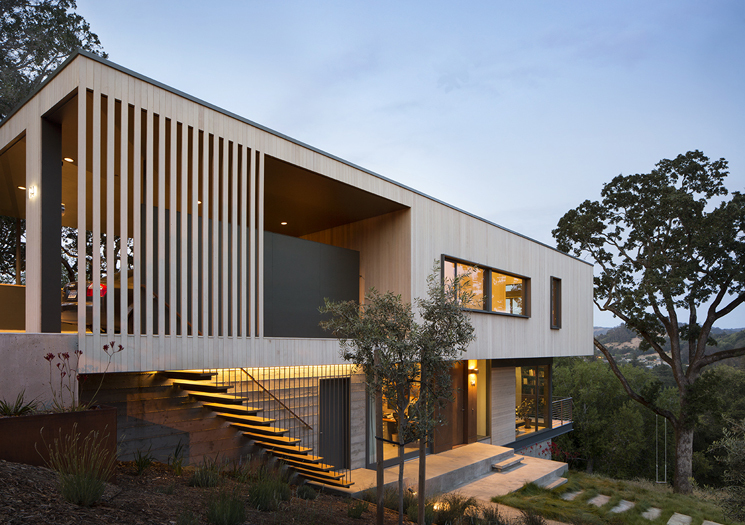 “Hillside House” was featured in ArchDaily. The media room performs very well, considering it’s small size! It truly is a high performance room. 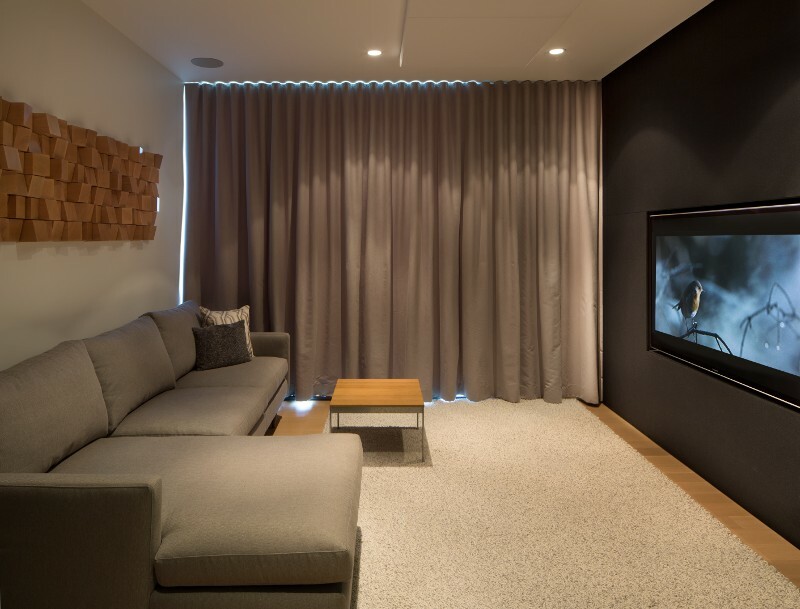 “In building our new home, we were looking to create a small, high quality media room that could also double as a family room for small children, and which fit with the modern design aesthetic of our home. We also had a limited budget. Nyal from Acoustic Frontiers worked with us from design and acoustic modeling through final system calibration, helping to create an awesome space that’s a very capable home theater as well. He did the majority of the installation himself. Nyal’s strength was his willingness to work flexibly with us from both a budget and design perspective. Although he’s of course well prepared to make equipment suggestions, he is also willing to work with whatever equipment is already in place to create the best system possible. We ended up with a mix of gear, but it all works together seamlessly. Post installation and calibration, the system looks and sounds phenomenal!” Dr. Rosenbaum.